At Albany’s main public library, bike parking is no problem. Counting our tandem, four bikes were leaning against whatever was there to lean them against. And two of them were chained to the playground fence. 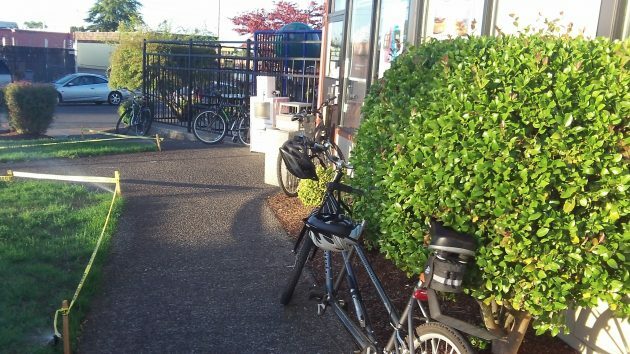 It works, obviously, but having a proper bike rack would probably work better, and it would keep the walkway clear. In contrast, destinations like the Albany Public Library on 14th Avenue recognize that some of their customers are likely to arrive on two wheels, and maybe some of their staffers too. So when the library was designed — about 10 years or longer ago now — the plans included bike parking with the rest of the remodeling of what had been an office building. 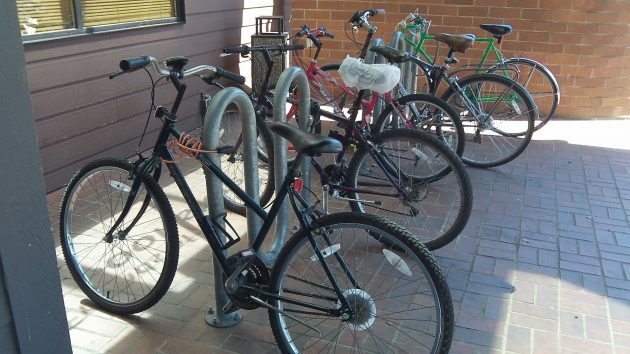 People using bikes to get around won’t let the absence of bike racks stop them. We’ll just lean the bikes against the nearest wall or post. (A post works better than a wall if we want to lock up our wheels.) But bike racks everywhere would be a nice thing to have. It would mean that business and building owners welcome bike riders as customers. I’m talking about the modern kind of rack, the kind where you lean the bike against a steel pipe shaped like an inverted U, like at the main library and the Albany City Hall, for instance. Not the kind where you stick the wheel into a slot so that if somebody bumps into the bike, the wheel is at risk of being bent. Perhaps the citizens of Albany should demand CARA funding for bicycle racks, particularly in the urban renewal district. You don’t have to “demand” anything. They’ll listen to all ideas and act on the good ones that they can. Just go to the next meeting and suggest it when they take public comments, or send it in by letter/email. Probably someone here has mentioned the crazy “public art” bike racks at Albany Station. I searched for a lock-up the first time a few weeks ago, stared at those things, and took an embarrassingly long time to realize they really were bike racks and not just sculpture (no other bikes were attached). They work. Lots of implications. A big step toward paradise on earth. Howling don’t be embarrassed. I doubt anybody noticed your long stare or cared as they were consumed by their busy lives. Think rats running on a caged treadmill. Paradise on Earth indeed! HH, I can’t help but notice you are spending SOME time at mass menu, generic fast food joints of late. I guess it is a-ok given you are expending so much energy on two wheels. And then there’s the racks at DHS that are placed against the wall and nearly useless.